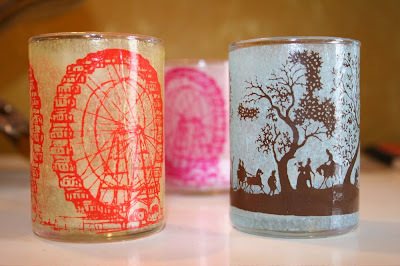 candle holders made from collages using scrapbook paper, stamps, vintage photographs and more. 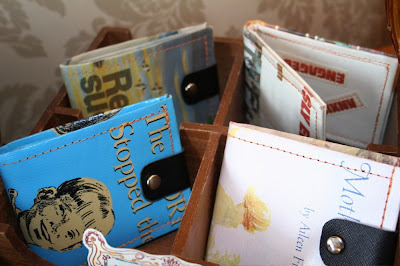 . .
Wallets made by MaxineDear. The wallet making process...they remove the covering from the cardboard backing which gives hardback books their stiffness, then wrap this woven material over a soft thin leather to create a sturdy and comfortable wallet. Fabulous. 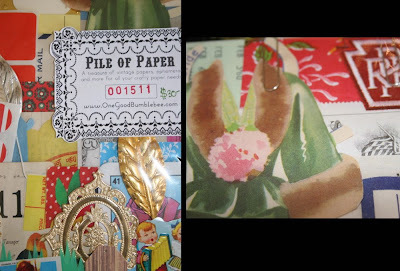 Paper packets chocked full of beautiful paper scraps, each little pile is a surprise from vintage wrapping paper to postage stamps, illustrations and more. Grab one for yourself, you deserve a little surprise. Note: Each mini pile is unique.